Jacobsen is launching new models of its GA Aerator Series. The GA450 and GA580 aerators will join the GA600 to create an extensive line of tractor mounted aerators, with each model having a specific width and working depth that can be used in a multitude of applications for the course. 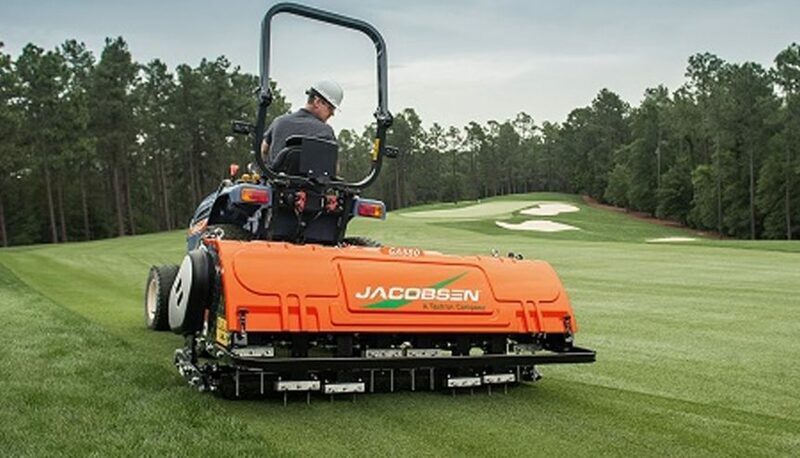 Each model features Jacobsen’s PerfectStrike technology, which delivers unrivalled hole quality and increased productivity when equipped with the optional AerStrike tine attachment system. The PerfectStrike patented design ensures tines enter and exit the turf vertically and from an optimal height. Its precise movement creates a truly straight and more perfectly round hole, providing uniform aeration with minimal damage to the root zone to allow turf to recover quickly. “With the addition of the GA450 and GA580, we provide the industry’s most comprehensive line of aerators, all featuring PerfectStrike technology which delivers superior hole quality while maintaining turf quality,” said Michael Parkhurst, Vice President, Golf for Textron Specialised Vehicles Inc, which designs and manufactures Jacobsen turf-care equipment. Each GA series aerator can be equipped with an AerStrike attachment system that delivers up to 70 per cent heightened productivity. Created for optimal spacing with a diamond pattern, the system enables single-pass aeration, reducing operation time and elevating turf conditions. Additionally, the GA series features a rear-mount roller location, with superior ground-following capability and a design that allows for quick, simple adjustment of aeration and easier maintenance. The new GA models will join the GA600 in Jacobsen’s line of GA Series Aerators. The GA600, when equipped with the AerStrike 4-tine attachment system, operates as the industry’s only aerator that performs deep aeration in a single pass.